Today digital marketing has impacted every sector be it e-commerce, FMCG, travel and many more. In fact, digital marketing channels are considered to be one the best growth avenues of the businesses. Today it has become one of the best tools to attract visitors with effective marketing strategy and planning the companies have used digital marketing to derive big sales by advertising their products on various digital platforms. So here are some best Digital Marketing channels which can boot your e-commerce businesses by 10 times. Unpaid or organic digital marketing channels includes all the visits which come from the popular search engines like Google, Bing, Yahoo, and DuckDuckGo because millions of people search for products related queries on these platforms. If the pages and content of your products are well optimized with correct and potential keywords. Your products page will come up first on the SERP boosting your website traffic and achieving your required ROI for the businesses. Email marketing is a good tool if you want to remind customers of about your sale. It is a good tool for reaching people who have visited your website you can remind them about your sale or promotional offers by the use of e-mail marketing you can reach your target and potential customers by uploading email lists on various e-mail marketing platforms like mail chimp. A lot of e-commerce companies are utilizing e-mail marketing to convert their potential customers who have visited their store. Paid search engines are also a great tool to reach millions of people searching for products online through various platforms like Google Ads, Bing Ads, and Yahoo ads. They have various types of advertising types where you can reach your potential customers who are interested in your products through the right keywords and interest targeting criteria. Even all of these platforms have special types of ads called product listing ads especially for e-commerce businesses. These ads play a key role in advertising your products with their image on these search engines thereby reaching your products to your potential people. Thereby achieving great sales for e-commerce businesses. Many e-commerce companies earn a million by these product listing ads. In today's world content is the king with great content you can win big milestones. Content can be in the form of blogs or videos. You can good blogs about your special products or some fashion trends. Today many big e-commerce giants leverage content marketing as a big tool to influence the buying behavior of the people. So you can't ignore content marketing if you want to derive good businesses for any e-commerce company. Social media is also a great tool for reaching people who are interested in your products. There are various social media platforms like Facebook, Twitter, LinkedIn and Instagram where you can reach your potential audiences. As all of these platforms have billions of users. In all of these platform, you can promote your products and offers in various creative ways by organically or using the paid ads. These are good and affordable means to reach your products to millions of people on social media platforms. E-commerce companies leverage this as a great tool make to sale out of social media ads. So social media also plays a key role in affecting purchase decisions for e-commence businesses. it basically refers to all those channels where you can advertise your products on other websites or affiliate partners. These also play a great role is boosting the sales for e-commerce businesses. Each e-commerce giants have their own affiliate programs for their products sale. referral marketing includes all those web visits that are from a third party or an app. This also includes websites which have the capability to show their ads or paid blog or electronic news paper. E-commence giants generate a huge amount of businesses from referral marketing also. Thus we can say that marketing on referral websites is also a greatest source of revenue for e-commerce businesses. 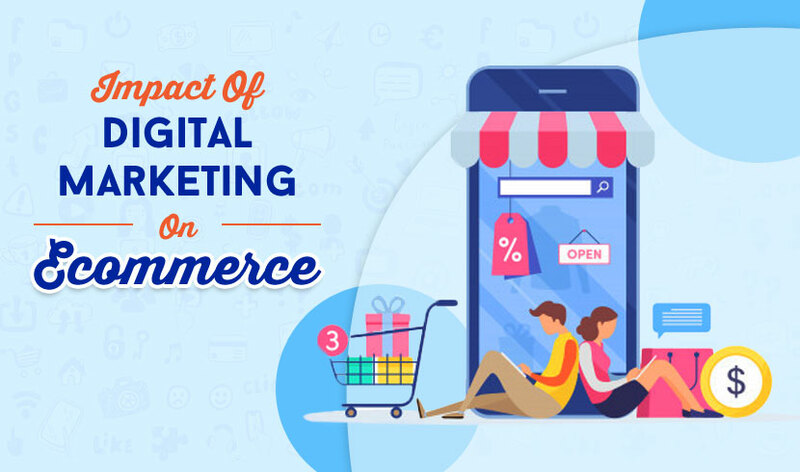 thus int he end, we conclude by saying that the right mix of digital marketing strategies play a key role in the success of an e-commerce businesses. In addition to it, there are also various tools for measuring the performances like Google Analytics and Omniture which gives a brief idea of about which products are getting more traffic or revenue. Thus e-commence businesses are using digital marketing strategies very well to leverage maximum ROI for their businesses.